This is how Brock University garnered “remarkable social media coverage among the student population,” according to Curtis Gadula, Manager of Off-Campus Living & Neighborhood Relations. 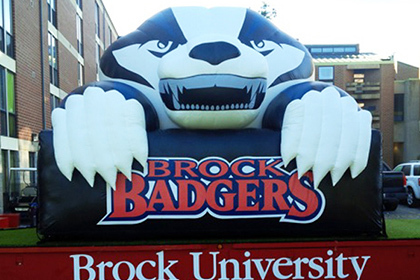 The Ontario-based school turned its mascot (Boomer the Badger) into an inflatable that has been used on a community parade float, at open houses, preview days, athletics banquets, sports camps, convocations and just about everywhere else they could think to place it. The goal was to increase marketing exposure, energy, athletic and university pride, and excitement about the school. Now that’s something to get excited about! Gooooo Badgers! Looking to engage college crowds at events? Browse our online gallery of custom inflatable mascots today!